Stomping on the Heels of a Fuss is one of several short stories in Halo: Evolutions - Essential Tales of the Halo Universe. It tells the story of an ONI operative named Connor Brien, who is sent to a Jiralhanae-captured human world, Beta Gabriel, only to find himself the subject of their violent sports. Noticing unrest in the local Jiralhanae hierarchy, Brien conspires with fellow captives to make an escape while the Jiralhanae argue amongst themselves. It was written by Eric Raab. Learning of the Jiralhanae invasion of Beta Gabriel, Connor Brien was granted permission to land on the planet and study their behavior. He is caught by a group of Jiralhanae hunters while he observes from a tree, and is brought back to their encampment around a landed Covenant vessel, the Valorous Salvation. While there, he witnesses the slow breakdown of the pack's unity. The pack is in fact the product of at least three separate clans which had recently been merged by the Covenant leadership. Two of these clans were ancient enemies that had fought even before the massive civil war that had knocked the Jiralhanae back to a pre-industrial state. Naturally, this led to tensions between the two factions within the pack. One clan, led by brothers Ceretus and Maladus, felt themselves to be the more intelligent faction of the pack, and their devout religious beliefs were more in line with those of the Prophets. The other faction, led by pack Chieftain Parabum, believed only in muscle and tradition, and used Forerunner relics in more opportunistic and disrespectful ways. During the Fall of Reach, Parabum exhibited cowardice when he ordered his ship to retreat from the massive attack, believing the human fleet to be too powerful an obstacle to overcome. Instead, the Valorous Savation landed on the nearby Beta Gabriel, and the Chieftain ordered that the ship's communications array be disconnected so that the Covenant would have no way of hunting the pack down and executing them for their disobedience. When they first arrived on the planet, the pack hunted the humans they found there and feasted as they never had before. As the number of humans dwindled, the Jiralhanae quickly consumed all of the Unggoy who had been aboard the ship; after the Unggoy were all consumed, Parabum decreed that the human prisoners only be eaten after engaging in elaborate hunts that required his sanction, much to the frustration of Ceretus's clan which he saw was unnecessary. Shortly afterward, Maladus snapped and challenged Parabum over his cowardice and abandonment of their duties to the Covenant. However, Parabum was far stronger and mercilessly pummeled him into submission before breaking his neck. As if this was not enough, Parabum then intentionally disrespected his opponent's corpse by tearing Maladus's throat out with his teeth. This only served to further enrage Ceretus. When Brien is brought to the Jiralhanae encampment, he finds the remaining human captives in a wretched state. One of the captives is a prominent religious figure named Dasc Gevadim who had hidden away on Beta Gabriel to increase the devotion of his followers (who were led to believe he had "transcended"). The restless Jiralhanae of Ceretus's hunting party kill one of the captives, Hague, for fun; however, when Parabum's hunting party returns and catches the disobedient Jiralhanae in the act, the Chieftain becomes angry and embarrasses Ceretus in front of the others. 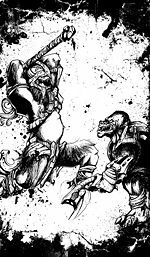 Parabum also takes the time to intimidate another Jiralhanae, Hammadus, as a means to keep him safely in line (Hammadus being described as a foot taller and broader than the Chieftain). Ceretus then begins plotting to overthrow Parabum, but he has no hope of beating the Chieftain in a direct challenge; Parabum was easily twice as strong as Maladus, and Maladus was stronger than Ceretus is. Instead, Ceretus tries to manipulate the young and naive Hammadus, whom Ceretus has determined is the only one strong enough to defeat Parabum, into doing the job for him. He does so by convincing Hammadus's brother and best friend, Facius, that he should make a suggestion to the Chieftain: reboard the Valorous Salvation, fake Parabum's death (thus protecting the cowardly Chieftain from any potential punishment), give the San'Shyuum an excuse for why the ship lost contact with the rest of the fleet, and throw themselves on the mercy of the Prophets. Facius agrees after Ceretus plays on his fear of being left behind on the Great Journey, remarking that, even if they fail, it would be better for the gods to know he tried instead of slowly wasting away with the gods' backs to them. As planned, Hammadus swears to his brother that he will protect him should Parabum reject the plan. As a leading UNSC expert on Jiralhanae, Brien recognizes that if he can somehow exploit the underlying tensions and pit the Jiralhanae factions against each other, he and his fellow captives will have a chance to escape. He identifies Parabum and Ceretus (or "Big Boy" and "Six" respectively, as he nicknames them) as the alpha males of the group, and in the event of a confrontation (reasoning that eliminating the alpha males would leave merely "a bunch of thugs"), plans to tranquilize them both and escape in the ensuing chaos. Facius outlines the plan to Parabum; to Ceretus's amazement, the Chieftain actually appears to consider his words. Immediately after Facius finishes, however, Parabum shoots down the plan and, following a confused objection from Hammadus, declares that there is no reason to leave the planet, for the Covenant will soon be no more and there is no will of the gods: The Forerunners abandoned them all long ago. This causes Ceretus to erupt with pious outrage. Parabum kills Ceretus with his gravity hammer before being tranquilized, along with Facius, by Brien. Chaos reigns, however only Brien and Dasc are able to escape - the remaining survivors are killed while either running away or attempting to take revenge on the Jiralhanae. The two survivors make it back to Brien's camp, where Dasc shoots Brien in the head with his own M6 pistol before help can arrive in order to preserve the secret of his disappearance, preferring that one man die so that the faith of his millions of followers can be preserved. Shortly afterward, UNSC reinforcements arrive, and though they find no human survivors, they slaughter the remaining Jiralhanae. Dasc hides from them and wanders amongst the corpses, feeling more lonely than he ever has in his life. The story provides some insight and reasons for the difference in appearance between the Jiralhanae in Halo 2 and those in Halo 3. Parabum is described as being more akin to the Halo 2 Jiralhanae with his unkempt visage and wearing only a few basic pieces of armor. Ceretus's description as well-groomed is more akin to the Halo 3 Jiralhanae. This suggests that such differences may be the result of personal or clan preferences. The name of the story comes from a song Brien's mother used to sing to him: "Hold no court, know no rust, just stomp, stomp, stomp, on the heels of a fuss."